TL;DR – Eating clean doesn’t have to be boring. Eating clean is all the rage now (especially with all that talk about diabetes) with plenty of cafes, salad bars and restaurants serving delicious clean eats. But eating clean doesn’t mean bland food. We bring you our favourite spots to grab a delicious and guilt-free meal! This trendy (thanks to its industrial-chic interiors) go-to spot for raw food has some impressive plates. Located in the Keong Saik area, Afterglow is a one-stop quick fix for wholesome meals to satisfy any cravings. Grab the Raw Vegan Nut ‘Cheese’ Platter – made from cashews – with Crackers, Deconstructed Sushi Bowl or the Drag-pom Salad, which is a mix of Dragonfruit with Pomegranate, Avocado and Macadamia. Hidden behind the Maxwell Chambers, Guac and Go is a good dining concept opened by two guacamole-lovers serving none other than guacamole! The guacamole here is creamy, but not too rich, and still retaining the sweetness of the avocados. Try their bestseller Guacamonster 2.0, which is a massive bowl of lettuce topped with quinoa, tomatoes, lentils and more, topped off with a generous scoop of guac. They also serve up delicious cold press juices, smoothies and coffee. Concentrating on tasty veggies, premium meats and a variety of grain options, Grain Traders serves up wholesome food in the CBD. Select your own toppings or choose from the pre-selected bowls with proteins such Grilled Striploin or Wasabi Salmon and vegetables such as Apple Kimchi and Homemade Cucumber pickles. 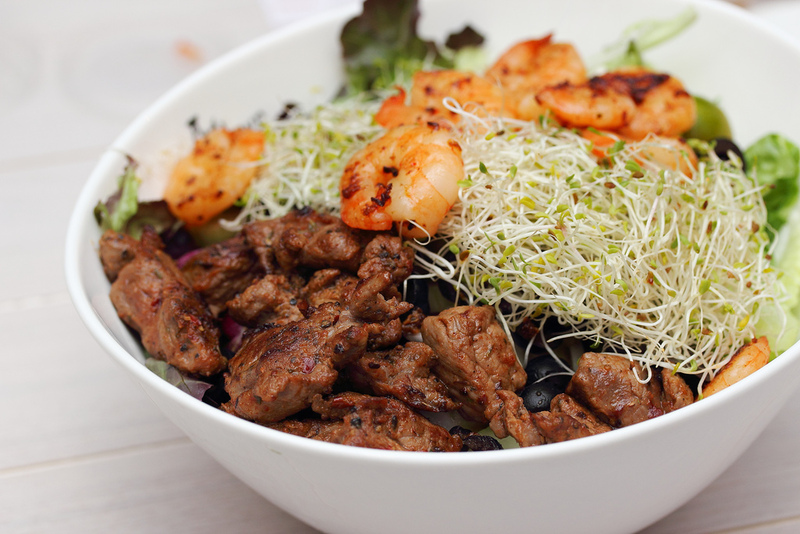 The Daily Cut is every meatlover’s answer to guilt-free protein bowls. Packed with healthily-grilled options such as chicken thighs, sirloin steaks, salmon fillet and veggie-friendly tofu, all of The Daily Cut’s protein salad bowls are completely customised. The menu is straightforward – choose from three sizes, the Regular (one protein, $12), Large (two proteins, $15) or the Beast (three proteins, $18). All salads come with one complex carb, three toppings and one dressing. For carbs, don’t miss the sweet potato, brown rice or the wobbly sous-vide egg; and for sauces, you must try the delicious Ginger Ponzu sauce. 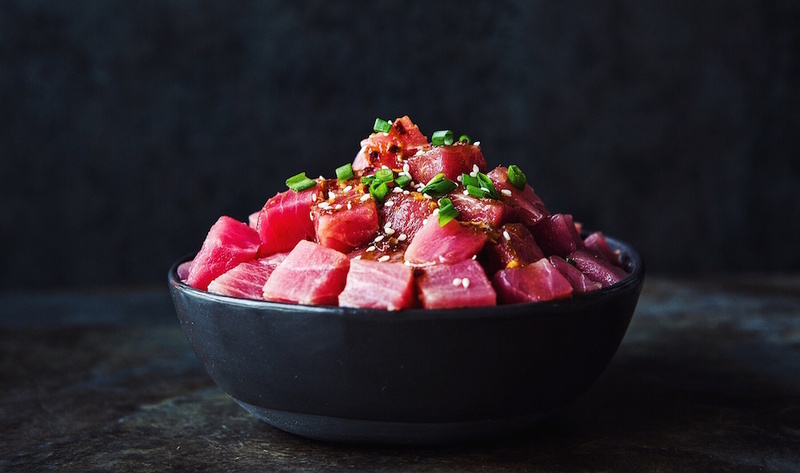 Poke (pronounced “Poh-Kay”, which means “to slice or cut” in Hawaiian) bowls are Hawaiian-styled staples that consist of fresh fish topped with various ingredients. 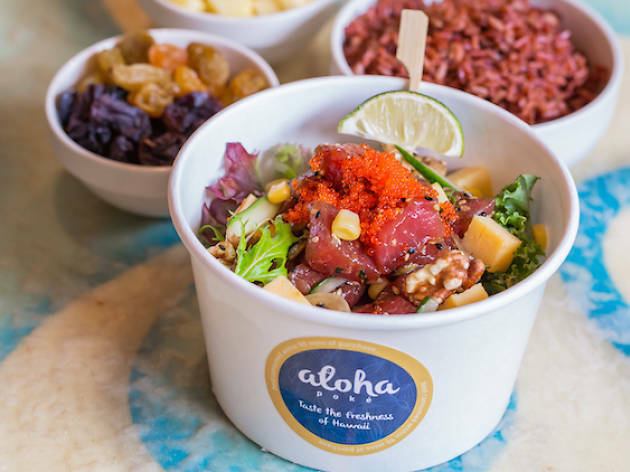 With a wide array of choices here at Aloha Poke, you can customise your refreshing poke bowl with tuna, salmon, tofu dressed in sauces like Wasabi Mayo and Nutty Sesame, atop rice or salad. Another place to get your poke fill is A Poké Theory. First you need to pick one of three options as your base – Sushi Rice, Lemon Herb Quinoa or Romaine Lettuce. Next, choose from four types of marinated fish – Spicy Mayo Salmon, Avocado Miso Salmon, Shoyu Tuna or Spicy Garlic Sesame Tuna. Then finish off with your own selections of toppings – Pineapple, Nori Flakes, Kale Chips and/or Spiced Roasted Cashew. Opening Hours: Mon – Fri: 11am – 6pm, Sat: 10am – 4pm. Closed on Sun. 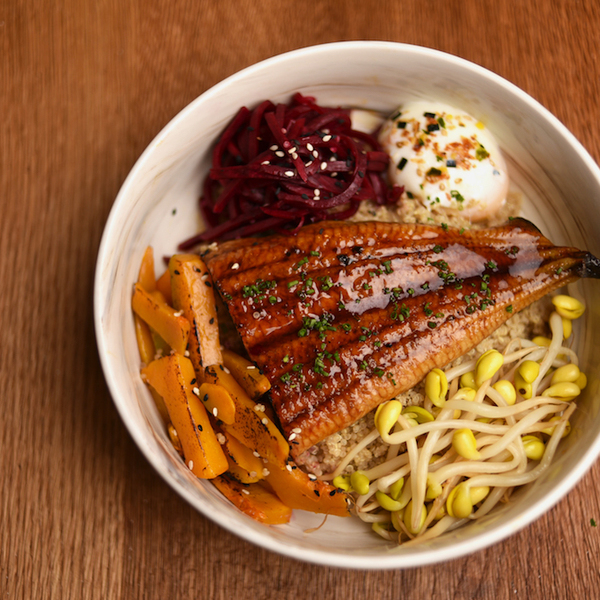 Serving up rice bowls on Duxton Hill, Ninja Bowl’s signature Japanese-inspired dishes are one of its kind. Packed with hearty, hearty ingredients, their signatures include Aburi Chashu (Torched Pork belly), Yaki Unagi (Grilled Eel) and NZ Grass-fed Flank Steak. Shinkansen offers Japanese-style protein bowls filled with meat and other interesting ingredients for you to mix together. Choose from 40 toppings to go along with your sashimi, salads, rice and even soba noodles. Can’t decide? Then have a go at their signature bowls like the Omega 3 Donburi, which is a mix of their unique Mixed Grain sushi rice with Salmon Sashimi, Maple and Genmaicha cured Salmon. Opening Hours: Mon – Fri: 10:30am – 7pm. Closed on weekends. Offering freshly-made healthy and tasty wraps, salads, quesadillas and more, you will be surprised by the large portions served here. Pick one of the 15 Chef Creations or you can make your own wrap or salad from 50 healthy ingredients and 19 House Dressings. What’s more, Simply Wrapps is Halal-certified too. Opening Hours: Mon – Fri: 8am – 9:30pm. Closed on weekends. Conveniently located in the business hub of Buona Vista, The Lawn Salad & Grill Café is a salad bar that serves greens and premium grills topped with unique dressings. As the name suggests, The Lawn Salad & Grill Café is located on a lawn. 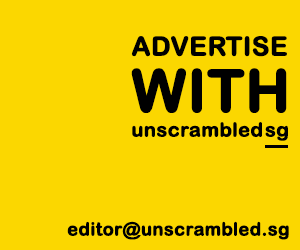 More specifically, it is a very quaint eatery amidst the lush greenery of Biopolis. You can customise your salad by choosing from 26 different types of toppings, 12 dressings suh as Honeyball (Honey, Dijon Mustard), Me So Spicy (Fresh chilli, Sambal Belachan, Mint) and Perky Sesame Ginger (Sesame seed, Coriander root, Grated ginger) and hearty meats such as Dory with Fresh Fruit Rub and Chicken Breast with Maple Infusion. READ MORE: Bet you missed these about the National Day Rally! Opening Hours: Mon – Fri: 10:30am – 9pm, Sun: 10:30am – 4pm. Closed on Saturdays. Next PostWant a recession-proof, disruption-proof job? The photo of Grain Traders is from http://www.pinkypiggu.com, and used without permission. Please remove. Thanks.